Chemical manufacturers create the adhesives, foams, plastics and other raw materials that are used to make most consumable products. 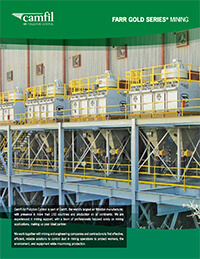 Many use batch mixing and other processes that create dangerous dusts. When operators handle these materials, convey or dump them into processing equipment, the dust becomes airborne and endangers air quality. For these reasons OSHA and EPA regulations require chemical processing facilities to capture and contain dangerous dusts – either at the source or from the air on a continual basis. Facilities can be held accountable for safety violations and receive stiff penalties if they do not demonstrate adequate protection from toxic and combustible dusts. OSHA recommends that workplace air quality be maintained through “engineering and work practice controls” where feasible. Dust collection systems are the most cost-effective way to improve air quality in a chemical manufacturing or processing facility. They work around the clock, using advanced filtration technology to safely capture and contain airborne dust and contaminants. 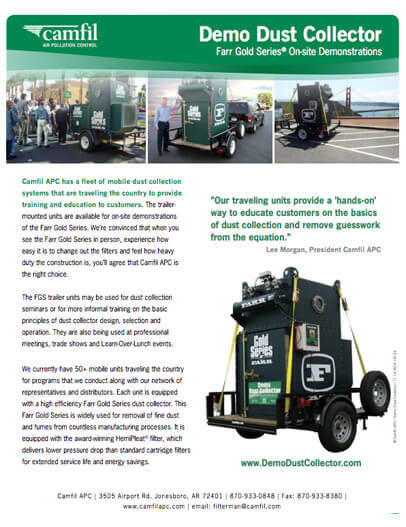 Camfil APC’s premium-quality dust collectors ensure that all employees can work safely in facilities that have toxic chemical dusts present. 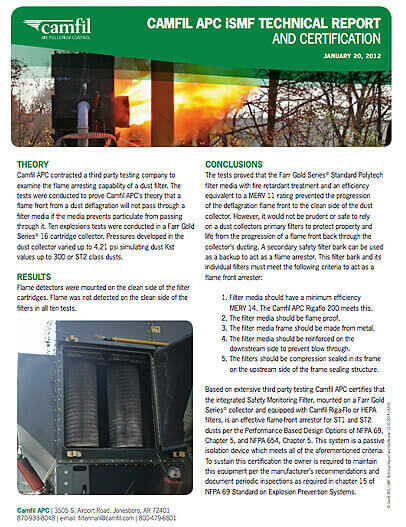 Camfil APC’s industrial dust collectors cost-effectively collect many types of chemical dust including toxic dusts, combustible dusts, cross contaminant dusts and nuisance dust. This means calculating the total cost of your dust collection system, taking into consideration not only the, but also costs for energy, replacement filters and downtime for maintenance. We have a rig dedicated for ANSI/ASHRAE Standard 199 testing to give you real world, apples-to-apples comparison data on our dust collectors. Data like emissions, pressure drop, compressed air usage, energy consumption, and emission readings shows you the real costs to operate the collector over time and make accurate system comparisons. 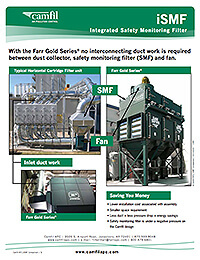 The Farr Gold Series dust collector performs well in applications where dry materials are batch mixed, conveyed and processed. Many of these materials, like pesticides and insecticides are dangerous materials that are toxic to workers and the environment. Other raw materials like silica carry long-term exposure risks that are regulated by OSHA. 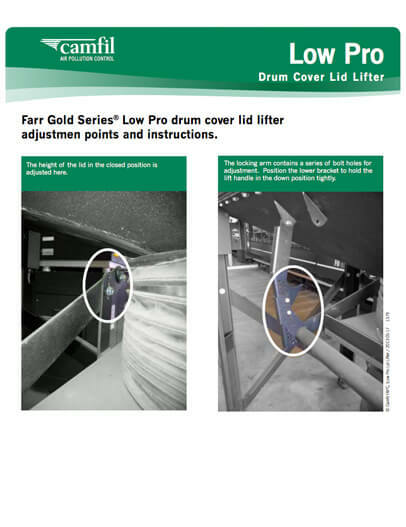 The Farr Gold Series combines high performance, a modular design, ease of service, and optional bag-in, bag-out filter change out. 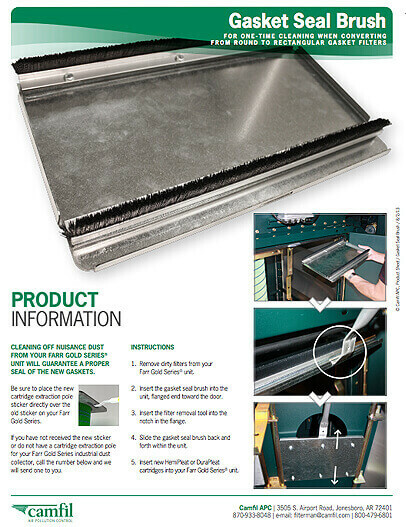 The FGS Camtain dust collector was created to safely contain potent and toxic compounds. It features a safe-change containment system for the filter cartridges and discharge system. It combines enhanced performance, safe-change containment technology and ease of maintenance. The QPP is a compact dust collector with a smaller footprint (49” wide x 42” deep x 87” high) so that it can be positioned on the production floor to remove high concentrations of hazardous dusts at the source. Its size and built-in explosion protection is ideal for continuous manufacturing processes. 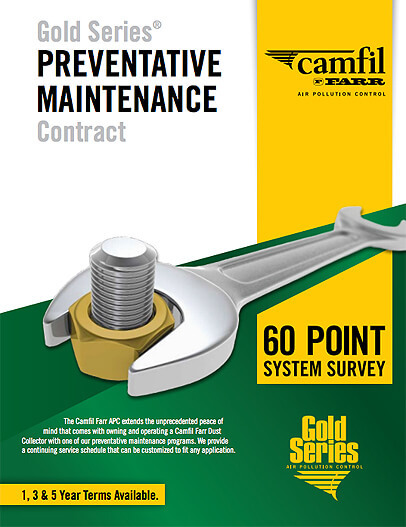 Call Camfil today to discuss how our products and services can improve your air quality and comply with government regulations. Some dusts simply react badly with skin and eyes. Other chemical dusts are fine particles that can travel deep into the body, damaging the kidneys, lungs, brain, intestines and prostate. Worker exposure to mineral elements like silica dust causes respiratory problems from chronic bronchitis to lung cancer. Worker exposure to metallic elements, such as cadmium, beryllium, arsenic, chromium and lead causes neurological, gastrointestinal and reproductive damage. OSHA has established permissible exposure limit (PEL) to chemical substances that endanger workers. Some examples of the PELs for various chemical dusts. 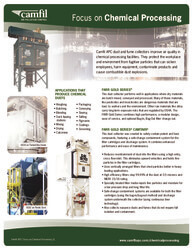 Combustible dust explosions threaten workers and capital assets like buildings and equipment. A powerful dust explosion can injure and kill plant workers and destroy buildings and equipment. 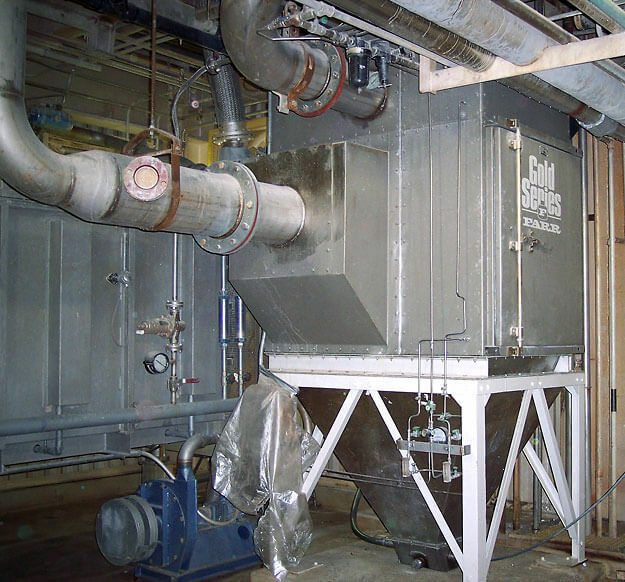 Dust collectors minimize the amount of combustible dust that can collect on floors and other surfaces, and they contain chemical dust in one area. But the dust collectors themselves can be a fire or explosion hazard if they are designed incorrectly or not equipped with controls that protect from deflagration and contain explosions. 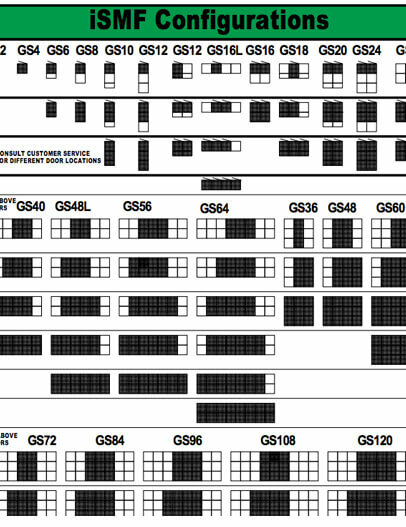 These controls include fire retardant cartridges, sprinkler connections, explosion vents, suppression systems, and backdraft dampers. Toxic dust can also cross-contaminate other chemical materials in the plant, which can reduce product quality and safety. For this reason, it is preferable to capture chemical fumes or dust at their source to prevent the dust from expanding throughout the plant. This is accomplished by incorporating a hood or extraction arm into the chemical process machinery. Source capture is extremely effective, and it requires the least energy and capital investment. However it is captured, dust and fumes should be isolated from the rest of the facility and contained in a specific area. For example, a portioned area can be kept under negative pressure. The extracted air is either drawn directly into a local collector or ducted to a dust or mist collector located remotely. 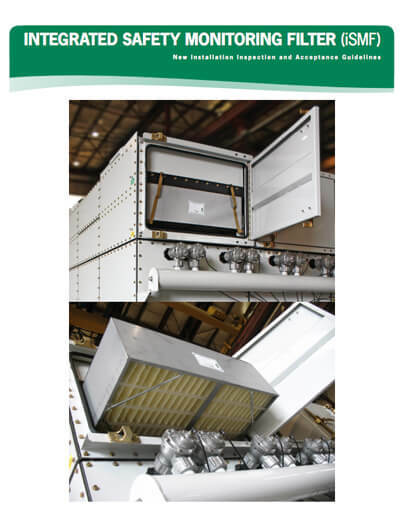 In some cases, the filtered air can be safely returned back into the facility to create a push-pull airflow pattern to improve the contaminant control. A chemical manufacturing facility may also require special options or accessories to improve the safety and reliability of the system. Bag-in/bag-out filters and collection drum options can be used to limit exposure and cross-contamination of collected material when performing filter and dust removal maintenance. 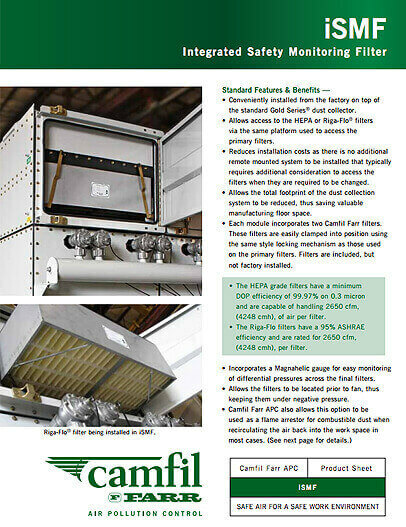 Additional features such as duct and equipment clean-out doors, stainless steel construction, safety after filters (ASHRAE, HEPA) and FDA compliant paint are also commonly utilized with the air filtration unit based on contaminant properties. 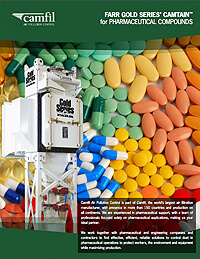 All Camfil APC dust collectors safely contain cross-contaminants. Airborne dust can also be a major housekeeping problem because it eventually settles on floors and surfaces. A dirty-looking facility can hurt your brand and make a negative impression on customers, potential employees and other visitors. Not only is the dust a nuisance to keep off floors and overhangs, but it can accumulate on equipment and electronics, causing them to malfunction or fail. 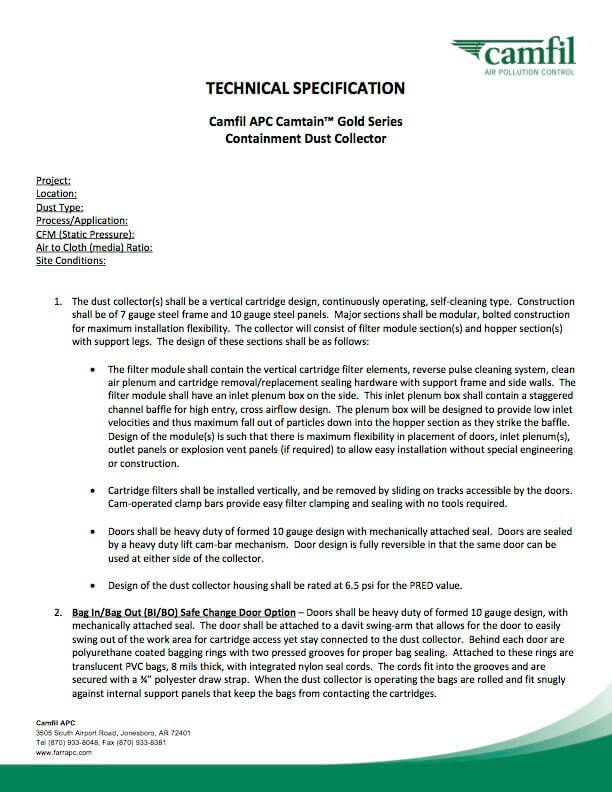 Selecting the appropriate equipment can be a daunting task, but Camfil APC dust collection experts help you – particularly through the critical design phase. We help assess your system, applications and physical space. We then determine the best solutions for meeting your production goals while keeping your workers safe and your operation in compliance. The first step is identifying the specific chemical makeup of your airborne contaminants. Our dust testing services identify properties like density, particle size and moisture content, helping you make more informed decisions on equipment, filter cartridges and engineered controls. Next, we examine the sources of dust at your facility, the quantity of dust generated, your run times, and how sensitive your operation is to production downtime. We also look at your space constraints, and options for placement of the dust collector. 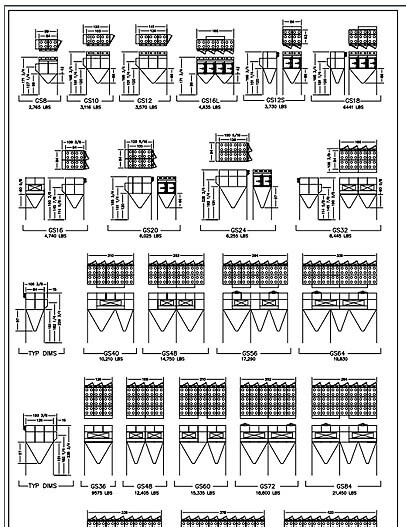 What style and size configuration is best?